Apart from adults adopting various healthy eating tips that, it is wise that children should also be involved in such eating practices. Many parents and guardians are so concerned about their diet and eating habits alone, they give little or no consideration about what their children or ward consumes, which at most times makes them vulnerable to some diseases and keeps them malnourished. As parents or guardians, we should know that it is our duty to feed our children or ward, and not only feeding them, we should ensure that they eat healthy. The food they eat contain adequate nutrition or should be a balanced diet so that they can remain happy, lively and even healthier. Most parents might have had experiences about their children refusing to eat some certain food which previously they have enjoyed eating. Most at times they end up spilling the foods on the floor. But that does not guarantee you as a parent to allow such an act to continue, because the children will end up losing most of the nutrients that is been supplied by that particular food. Most children exhibits a fussy character while eating, they loss interest of the food and sometimes they even cry when they are been forced to eat. This act is totally normal, for most children. But as a parent, the way you will manage this fussiness can go a long way in affecting whether the child will grow out of it, or he/she will continue with it as they grow older. This is where the importance of parents and caregivers in helping the children to develop a healthy eating habits comes in to play. Let us look at 10 healthy eating tips that parents can adopt for their children. 1. Parents should offer their children a variety of different tastes and textures of food when they are young, so that it will encourage them to enjoy different kinds of foods as they grow up. 2. If you will observe as a parent you will discover that it is quite difficult for a toddler to ear large amount of food at a particular meal time. So the best is to space three small meals and three small snacks equally throughout the day. 3. Parents should have in their mind that food is a necessity. It should not be used as a reward (e.g. for portraying a good behaviour or for eating another, lesser liked food), or taken away as a punishment for a wrong deed. 4. Restricting some particular food from a child can make them unintentionally desirable by the child. keeping foods in the house that children can see but are not allowed to eat, makes those foods more appealing to that child. Children are then more likely to eat such foods when given the slightest chance, for example when they come across such foods in occasions such as parties etc. 5. Still on restriction. If you are restricting some unhealthy foods from your children, it is better you do that secretly, It is very hard to restrict such foods from a child when the temptation is directly in front of them. For example, do not maintain the habit of always walking past the sweetshop or a fast food restaurant whereas you are only keeping healthy foods at home. 6. 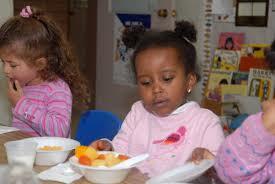 Introduce new healthy foods to your children periodically. It can take about 15 to 20 exposures of before a child will accept the taste of a new food. Always encourage your child to touch, taste, smell or lick a food. By carrying out this practices, you can make the food to be more familiar to the child, which will make him/her to likely eat it. 7. Do not force your children or pressure them to eat more than what they desire. The "clean your plate" norm is a thing of the past, and it can teach children to ignore the natural signs of feeling full, which could eventually make them to become overweight. 8. Avoid feeding a child in front of a television, because most times does serve as a means of distraction, and it prevents them from eating. 9. Always praise your child after trying a new food and exhibiting a good behaviour at the table. 10. Children loves to imitate whatsoever they see. If they observe you as a parent enjoying your vegetables at dinner time, they will likely love to have the same feeling too. These are the proper healthy eating tips parents can adopt for their children.